The New Resolution window lets you create a custom resolution. Your new resolution will appear in the Camera Size menu of both the New Project window and Welcome screen. See Creating Projects and Deleting a Custom Resolution on page 1. In the Welcome screen or New Project window, click the Add button to add a new resolution to the list. The New Resolution box opens. This is name you give the custom resolution. Your new resolution will appear in the Camera Size menu of both the New Project window and Welcome screen. This is the width of the resolution that will be created. This is the height of the resolution that will be created. Displays the ratio between the horizontal and vertical dimensions of the camera framing. Each resolution setting has a preset aspect ratio that cannot be changed. 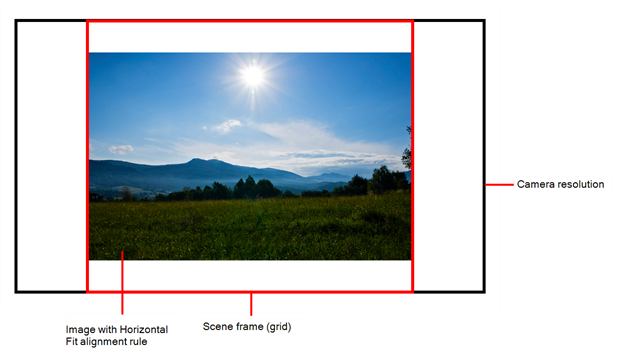 Enlarges or shrinks (but not distort) to your image height to match the full width of the scene frame (alignment grid). 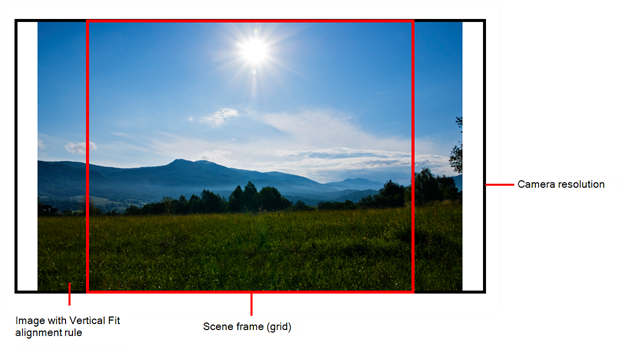 Enlarges or shrinks (but not distort) to your image height to match the full height of the scene frame (alignment grid). After selecting this option, enter a value, in degrees, of the angle that you want the camera cone to be. Increasing this value will make the camera cone wider (the angle is more obtuse). Widening the FOV will make the grid and all elements appear farther away. Decreasing the default value will create the opposite effect. Sets the frame rate for your project. The higher the frame rate, for example 30 fps, the faster the animation will play. The lower the frame rate, for example 12 fps, the slower your animation will play. Avoid going under 12 frames per second as your animation will have a choppy playback. The human eye requires a minimum of 12 frames per second to perceive a fluid animation.